Persia is forced to cede what is now Georgia, Dagestan, most of Azerbaijan, and parts of northern Armenia to the Russian Empire. The 1804–1813 Russo-Persian War was one of the many wars between the Persian Empire and Imperial Russia, and began like many of their wars as a territorial dispute. The new Persian king, Fath Ali Shah Qajar, wanted to consolidate the northernmost reaches of his kingdom—modern-day Georgia—which had been annexed by Tsar Paul I several years after the Russo-Persian War of 1796. Like his Persian counterpart, the Tsar Alexander I was also new to the throne and equally determined to control the disputed territories. The Persians scaled up their efforts late in the war, declaring jihad, or holy war, on Imperial Russia in 1810. Russia's superior technology and tactics ensured a series of strategic victories. Despite the Persian alliance with Napoleon, who was the ally of Persia's Abbas Mirza, France could provide little concrete direct help. Even when the French were in occupation of the Russian capital, Moscow, Russian forces in the south were not recalled but continued their offensive against Persia, culminating in Pyotr Kotlyarevsky's victories at Aslanduz and Lenkoran, after the setback in the Battle of Sultanabad in 1812 and 1813 respectively. Upon the Persian surrender, the terms of the Treaty of Gulistan ceded the vast majority of the previously disputed territories to Imperial Russia. This led to the region's once-powerful khans being decimated and forced to pay homage to Russia. 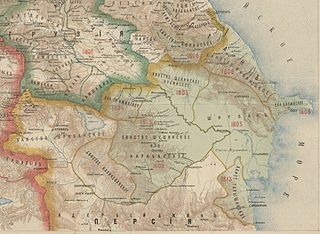 In late 1803 Pavel Tsitsianov demanded the submission of the Ganja Khanate southeast of Georgia, over which Georgia had some nominal claims. He was now no longer unifying Georgia or liberating Christians but moving against territory that was clearly Muslim and Persian. On 3 January 1804 Ganja was taken with a good bit of slaughter. Abbas Mirza's army arrived too late and retired south. In June Tsitsianov and 3,000 men marched south toward Echmiadzin in the Yerevan Khanate. They were driven back by Abbas Mirza and 18,000 Persians (?). They then moved east and besieged Yerevan (July–September). The local khan held the citadel, the Russians held the town and the Persians held the surrounding countryside. Weakened by disease and fighting on half-rations, the Russians withdrew to Georgia, losing more men along the way. Troops were moved west to deal with the Turks, a truce was made and Nibolshin was left to guard the frontier. Fighting resumed in 1808 when Russia took Echmiadzrin. Abbas Mirza was defeated south of Lake Shirvan and Nakhichevan, or some part of it, was occupied. In September 1808 Gudovich attacked Yerevan. The assault failed, withdrawal became necessary and 1,000 men, mostly sick and wounded, froze to death on the retreat. Escape was only possible because Nibolshin and Lissanevich defeated a "vast horde" of Persians. Gudovich resigned and was replaced by Alexander Tormasov. In 1809 Fath Ali was driven back from Gyumri and Abbas Mirza from Ganja. In 1810 Abbas Mirza tried to invade Karabakh but was defeated at Meghri on the Aras River. In early 1812 Persia invaded Karabagh. They occupied Shakhbulakh which the Russians regained. They attacked a Russian battalion at "Sultan-Buda" using European-style infantry and a few British officers. After a day of fighting the Russians surrendered. Russia responded to this unusual defeat by moving Pyotr Kotlyarevsky, the hero of Akhalkalaki, from the Turkish to the Persian front. In the summer of 1812, just as Napoleon was preparing to invade, Russia made peace with Turkey and its Caucasian troops turned to Persia. On 19 October Kotlyarevsky ignored the cautious Ritishchev's orders, crossed the Aras River, and routed the Persians at the Battle of Aslanduz. He then crossed the snow-covered Mugan Plain and after a five-day siege stormed the new-built fort of Lenkaran. 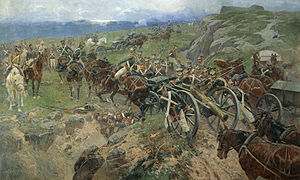 The Russians lost 1000 men, two thirds of their force. Of the 4000-man garrison, every survivor was bayonetted. Kotlyarevsky was found wounded among a heap of corpses. He was carried half-dead to Tiflis and survived for 39 more years, unfit for further service. A victory at "Karabezouk" completed the discomfiture of the Persians (3 April 1813). News of Napoleon's defeat reached Persia in the spring of 1813. Peace negotiations were already underway and an armistice was made in October. By the Treaty of Gulistan Persia recognized Russian possession of all the Khanates it held and gave up all pretensions to Dagestan and Georgia. The border in the northern part of Talysh was left for later decision. Persia kept Meghri in southwest Karabakh which the Russians had abandoned as unhealthy and inaccessible from the rest of Karabakh. Abbas Mirza was a Qajar crown prince of Persia. He developed a reputation as a military commander during the Russo-Persian War of 1804-1813 and the Russo-Persian War of 1826-1828 with neighbouring Imperial Russia, as well as through the Ottoman-Persian War of 1821-1823 with the Ottoman Empire. He is furthermore noted as an early modernizer of Persia's armed forces and institutions, and for his death before his father, Fath Ali Shah. Abbas was an intelligent prince, possessed some literary taste, and is noteworthy on account of the comparative simplicity of his life. Fath-Ali Shah Qajar was the second Shah of Iran. He reigned from 17 June 1797 until his death. His reign saw the irrevocable ceding of Iran's northern territories in the Caucasus, comprising what is nowadays Georgia, Dagestan, Azerbaijan, and Armenia, to the Russian Empire following the Russo-Persian Wars of 1804–13 and 1826–28 and the resulting treaties of Gulistan and Turkmenchay. Historian Joseph M. Upton says that he "is famous among Persians for three things: his exceptionally long beard, his wasp-like waist, and his progeny." The Treaty of Turkmenchay was an agreement between Persia (Iran) and the Russian Empire, which concluded the Russo-Persian War (1826–28). It was signed on 10 February 1828 in Torkamanchay, Iran. By the treaty, Persia ceded to Russia control of several areas in the South Caucasus: the Erivan Khanate, the Nakhchivan Khanate, and the remainder of the Talysh Khanate. The boundary between Russian and Persia was set at the Aras River. 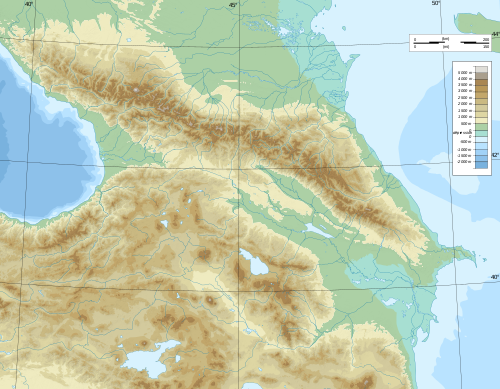 These territories comprise modern-day Armenia, the southern parts of the modern-day Republic of Azerbaijan, Nakhchivan, as well as Iğdır Province. The Ganja Khanate was a semi-independent Caucasian khanate that was established in Afsharid Iran and existed in the territory of what is modern-day Azerbaijan between 1747-1805. The principality was ruled by the dynasty of Ziyadoglu (Ziyadkhanov) of Qajar extraction as governors under the Safavids and Nadir Shah. Shahverdi Solṭan Ziyad-oglu Qajar became the khan of Ganja in 1554. The Nakhchivan Khanate was a khanate that was established in Afsharid Persia in 1747. The territory of the khanate corresponded to most of the present-day Nakhchivan Autonomous Republic and Vayots Dzor Province of present-day Armenia. It was named after its chief settlement, the town of Nakhchivan. 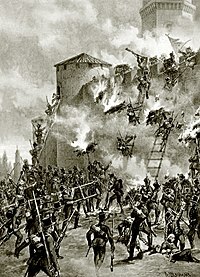 The Battle of Ganja, Siege of Ganja Fortress or Assault on Ganja, was the result of a Russian offensive in the South Caucasus intended to conquer the Ganja Khanate, which contributed to the escalation of the Russo-Persian War (1804–1813). The Siege of Erivan took place from July to September 1804, during the Russo-Persian War (1804–13). After a difficult advance, the Russians under Pavel Tsitsianov besieged Erivan. 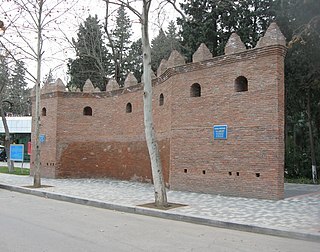 The Iranian forces inside Erivan's citadel prevented the Russians from making a direct attack, while those outside the citadel surrounded the Russians and cut the invaders' supply lines. Commanded by Crown-Prince Abbas Mirza and King Fath-Ali Shah Qajar himself, the Iranians successfully defended the city and defeated the Russian attack. Tsitsianov, in order to save his reputation, shifted the blame on a plethora of people and matters, and deliberately left out his own wrongdoings.